Carnethy 5:- results. Tony Heron helps us out:-"Full on conditions for the 48th Carnethy 5 hill race. The C5 is arguably Scotland's biggest and best race, which I'd clocked at just over 9 kms. However, with five proper summits - Scald Law, South Black Hill, East and West Kip, and Carnethy - visited in this short distance, there are few tougher races in the calendar. At the start, the marshals were warning of 40 mph/ -20 windchill and poor visibility on the summits - and so it proved. Thankfully, we had the wind behind us on the brutal climb of Scald Law, but after that it was just a matter of keeping your head down and getting round as quickly as possible. The marshals did a brilliant getting everyone around the course safely - especially those on the penultimate checkpoint on the summit of Carnethy where the weather conditions where just just plain ridiculous. The men's race was won comfortably by Finlay Wild ahead of Tom Addison while Hannah Russell beat local favourite Charlotte Morgan in the women's race. 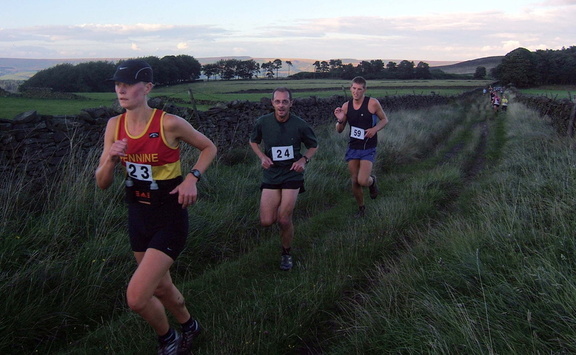 I only spotted two brown vests in the results - me (69th and 20th V40) and Duncan Marsh (336th and 93rd V40). 471 finishers. " Windy Hill- over Blackstone Edge.. Those with fond memories will remember that Edale Skyline, and this was at times equally interesting, with runners disappearing into the driving white stuff - though not as windy as was Edale. Being only a medium race, we weren't on the top that long, and once turning for home had the wind nicely behind us. Results.